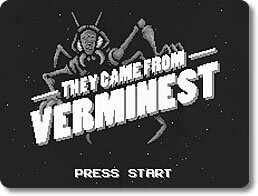 They Came From Verminest Game - Download and Play Free Version! 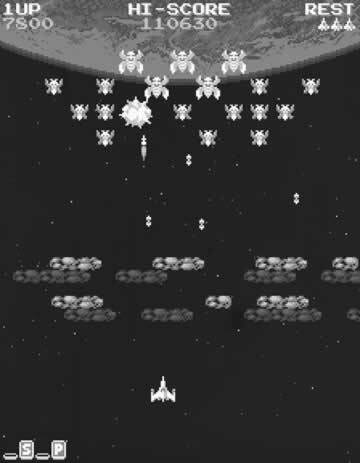 Defend Your Planet and Fight Queen Verminia in This 50's Inspired Galaga Style Shooter! Galaga has been an arcade favorite for generations. 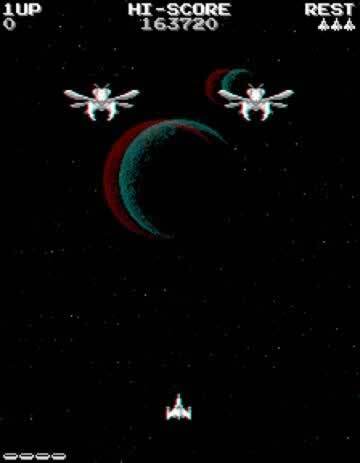 Instead of merely creating yet another Galaga port, the developers at Locomalito took the heart and soul of Galaga and made it their own by adding bits and pieces from other classic titles such as Centipede and Asteroids to create a game that features the very best the space shooter genre has to offer. To top it all off, they have made the theme of their new creation the classic 50's sci-fi B movie. The result is a new game that looks, sounds and plays like an old favorite from yesteryear. Normal: Smooth grayscale graphics are crisp and slick, making it easy to blast those bugs! Old Movie: A 50's inspired filter is applied to the game, making it look just like an aged black and white film. 3D Anaglyph: If you have a pair of anaglyph 3D glasses, the game will come alive in eye popping 3D. Once your ship has blasted into space, the nasty bugs line up to blow you to bits. The key is to shoot them while dodging the shots they are firing at you. Your ship can maneuver out of enemy fire by dodging right and left and can also move up and down the screen depending on the position of the enemy. Your best bet is to be a moving target. The alien bugs are sometimes willing to attempt kamikaze style attacks in order to take you down, so never underestimate them. Shooting eggs and destroying the shell will give you useful power ups. As you battle your way through the enemies, you will be rewarded with new challenges and difficulties. There are a wide variety of different landscapes, enemies and bosses to keep you on your toes. Turrets, spikes and barriers also add new dimension to the basic shooting gameplay. If you are daring enough to shoot the enemies at close range, the game rewards you according to the danger. Also, scaring your foes by destroying their leaders first also gives you a bonus. The more medals you earn, the higher your final score. Verminest allows you to completely customize the controls to suit your playing style. Do you have a joystick or controller? You can use them with this game for an authentic arcade experience. They Came From Verminest is an action packed space shooter adventure sure to please both old school videogame veterans and newcomers alike. With authentic graphics, sound effects and physics, it's an instant classic!